In 2013, IT News Africa called Morocco the most connected country on the continent. Morocco’s Internet penetration rate of over 50% is the highest in all of Africa, while the rate for mobile phones is well over 100%. 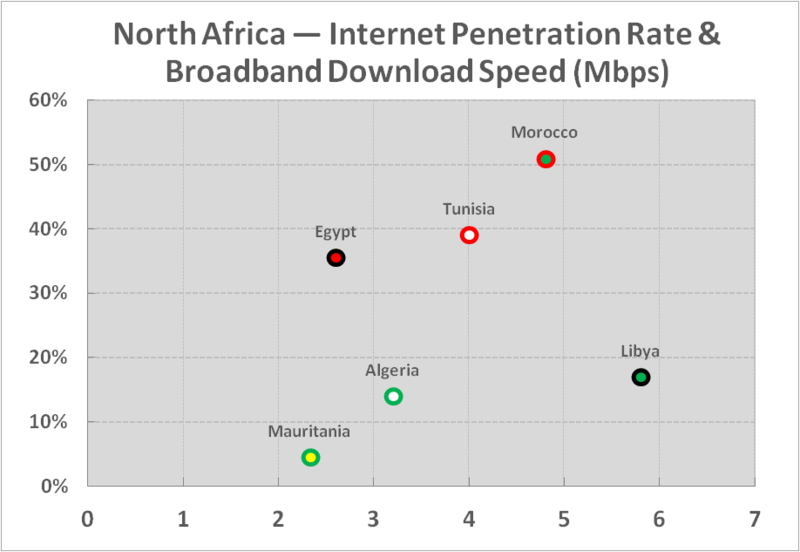 Download speeds are relatively fast at 4.8 mbps, and Moroccans are some of the most prolific tweeters and Facebook users in Africa. The Internet is also becoming even more free in the country, as Freedom House praised a recent series of liberalizing measures by the government. Morocco “has emerged as a trailblazer” by creating a national Information & Communications Technology (ICT) strategy, notes infoDEV in their 2011 report, “Broadband in Morocco: Political Will Meets Socio-Economic Reality.” Starting in 1999, the strategy was to create a more vibrant ICT ecosystem through privatization. Morocco was one of the first countries in the MENA region to institutionalize “a regulatory environment for promoting competition in the telecom sector and as such made great strides in leveling the playing field for private operators to enter and succeed in the market.” This paved the way for subsequent plans such as e-Morocco/Digital Morocco, and eventually this ecosystem would benefit the growing use of the Internet and new mobile technologies. Morocco has also worked to keep access high by keeping prices low by using targeted subsidies. As a result, the Alliance for Affordable Internet named Morocco the top developing country on its Internet Affordability Index. It’s also quite the value, with some of the fastest download speeds in Africa. Using this formula, Morocco has achieved an excellent combination of both access and speed. The option of holding a beauty contest rather than an auction to award licenses is attractive for government…in a beauty contest the request for proposals focuses on technical criteria rather than price, and includes…rural areas, job creation, service provision, and…strong indication of financial viability. In the case of Morocco, ANRT ran a beauty contest in 2006 to award three 3G licenses and the results were astounding – mobile broadband subscriptions increased 530 percent between 2007 and 2008. Not only were the best companies chosen for better overall criteria, but they were then in direct competition to the benefit of consumers. The infoDEV report outlined the various deals and offers presented by the winning companies to attract consumers. This is a big reason why the subscription rate continued to increase well after 2008. 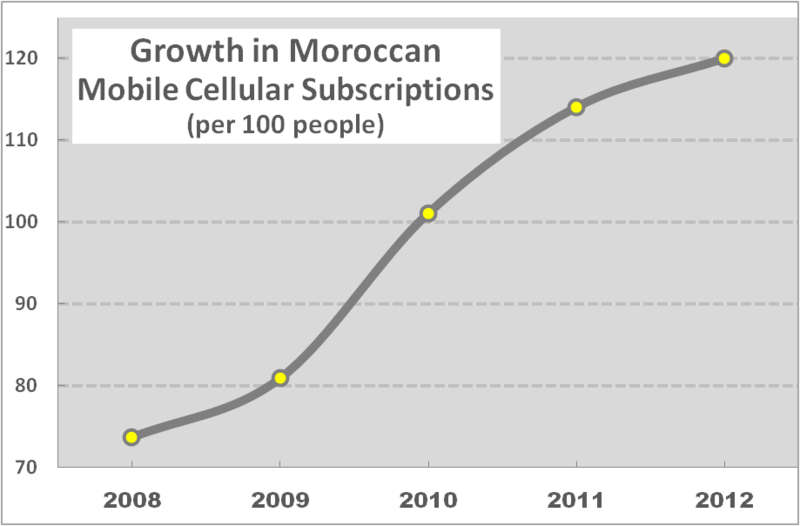 By 2010, there were over 100 mobile phones for every 100 Moroccans. Morocco has worked decisively and proactively to establish itself as the most connected country in Africa. There are several ongoing challenges to overcome in order to fully take advantage of this opportunity. If Morocco continues on this path, there is incredible potential for more and better employment, entrepreneurship, and growth in the country. David Bloom is a Senior Research Associate at the Moroccan American Center.